In the olden days (like 3 weeks ago), I thought the one task that separated the dreamers from the builders was lofting. But this week I decided there is another indicator of serious intent, at least for traditional boat builders. It's when your reading list starts to include more wood working books than boat building books. Through my carefree years as an armchair builder, I enjoyed reading all the boat building books: Chapelle, Roselle, Buehler, Gardner, Pardey, McIntosh, and Atkin. But reading ain't doing, so as I started making sawdust, it gradually dawned on me that all of the traditional boat building books make the same assumption: that the reader is not a computer programmer or someone equally useless in a boat yard, but an experienced wood worker. Someone who is as comfortable sharpening chisels, as he is with chewing the fat with the boys down at the local sawmill. Knowing even less about wood working than about boat building, my reading list started to include titles like Restoring, Tuning & Using Classic Woodworking Tools , by Michael Dunbar, and Understanding Wood , by R. Bruce Hoadley. At first, this diversion seemed innocent enough. It's only natural that an aspiring wooden boat builder would need to learn a bit about tools and wood. 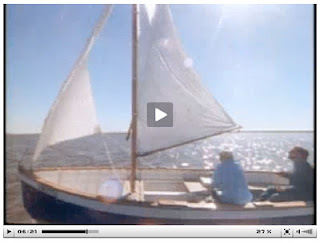 After all, what is a boat builder except a fellow with tools, wood, and way too much free time? But it's a slippery slope. Let me give you an example. This week, as I started my quest to find the wood to build Cabin Boy, I visited two of the closest lumber yards on my list. Suburban Mills in Huntington Station had a smallish collection of hardwoods in a shed behind the office. One of the guys was very helpful and pulled out various bits of White Oak for my inspection, but he didn't have anything big enough for my keelson, which was the main thing I was looking for. On the other hand, Roberts Plywood in Deer Park, had enormous slabs of air dried White Oak stashed in a corner of their warehouse. These were 9 or 10 foot long slabs of oak, sawn right through the tree, about 2 inches thick, with bark on both sides. The one that seemed best for my use looked like it weighed about a thousand pounds. Or at least a few hundred. Whereas I was looking for the equivalent of a nice bit of steak wrapped in plastic, this was an enormous side of beef. Yes, my 5/8" x 5" x 8' keelson was hidden somewhere inside that slab of oak, but how to get it out? Luckily I was driving Helena's tiny Honda Fit, which would have been crushed like a bug if I lowered that massive monster onto it's roof, so I had a good excuse to retreat and think things over. "Riving" is splitting wood down it's grain. I could use this technique to split the slab from end to end into smaller slabs, that would still be 2" thick. "Resawing" is sawing wood, particularly to turn one thick plank into two or more thinner planks. One of the galoots on the Old Tools forum is the author of this week's "Blog of the Week", Bob Easton. Bob pointed me to a fine tutorial that he wrote on Resawing Long Lumber. You should definitely check it out, but in a nutshell, he showed how I could turn that huge slab of oak into any number of smaller parts for Cabin Boy. In fact, I could probably get all the oak I needed out of that slab, and still have half left over. Since my dingy fund is perpetually short of cash, this was an attractive proposition. However -- and now we finally come to the nub of this blog post -- to make use of this resawing technique, I'd first need to build a frame saw, which meant buying an old ripsaw, cutting a blade off the saw, removing all the teeth and then recutting and sharpening a new set of teeth, and then mounting this new blade into a frame. Then I'd need some way to hold the board steady while I sawed it. Bob has some neat stools that are perfect for this, that I could build. Then I'd need to practice, because resawing this way depends on the woodworker's skill, not mechanical guides, for accuracy. I refer you to Bob's tutorial for complete details. Since anyone interested in traditional boat building is also likely to be attracted to traditional wood working tools and methods, I must say that I was pretty hot on this idea, and still am! But as I was explaining this little detour to Helena, with much excitement and sketching, she reminded me of my goal of launching Cabin Boy in the spring. Did I really have time for this? Of course, the answer was no. And here is the nub: both boat building and wood working require learning many interesting skills. Some of which, like rigging, sail making, and the milling of lumber, are big enough to be a profession in themselves. It is extremely tempting for an enthusiast like myself to get lost on one of these detours. They are so very, very interesting. But if the newbie boat builder is ever to finish his boat in a reasonable amount of time, he must restrain himself as much as possible. He must dip his toe into each of these oceans of knowledge, learning just what he must before turning to the next task, rather than plunging in head first. And this, dear reader, is the cruelest boat building lesson I've learned so far. Bob is both an experienced boat builder and wood worker, and he loves to share his knowledge with newbies like me. His tutorials, frankly, are mind blowers, and I'd give anything for his work bench. A fantastic resource and the kind of guy I'd like to meet some day. Check it out. This is a professionally produced video about the making of the traditonal Seabright Skiff by a very experienced boat builder in New Jersey. He makes it look so easy! You can use the standard substitute for time, money. Any of those lumber yards will gladly reduce the stock to dimensions closer to those of your parts. ... for a little money. Fabulous film! Thanks for finding it. I wonder if Charlie is still around; looks like that film was made some time ago. Just have to say that I'm enjoying your blog. While I am fairly handy, as a fellow geek & a wooden boat owner, I can relate to entering an entirely different field. Lots to learn!